Parenting is not easy and it needs tonnes of patience to keep yourself going. Forgiving & forgetting many things. Forgiving your kids mistakes, forgetting the mess they create. And again behave as if nothing happened. Parenting makes you exhausted and drains out all energy. Especially for new parents, precisely moms. So we need to find out some ways to energize ourselves and feel better. In this post, I will share five such tips. You may call it a power nap, something which puts energy back in you. I do it in the afternoon after lunch. It might be as short as half an hour but it recharges body and mind. You feel energetic and better. So moms do take a short nap whenever possible, it will give you the much-required break from your tiring routine. Tea & coffee helps to remove headache, body ache and one feels better after having it. When taken with your favorite snacks one feels awesome and good. So Tea/Coffee with healthy snacks is a good way to energize yourself. I know it’s a bit difficult one especially for new moms but you need to do it whenever possible to energize yourself. The way of having Me Time might differ from person to person but it’s a necessary one. For me, it’s either sitting in a nearby park alone or spending some time on Youtube watching some Funny Videos, Cooking ones, some Songs etc. Everyone needs some sort of entertainment as one gets bored of same monotonous routine and moms do need it badly as they get tired of finishing their daily chores. So go ahead and spend some time for your entertainment. I love spending time in a park among greens, flowers, trees, birds as it clams mind and one gets positive energy and feels good in the lap of nature. 4. Send your kids out with their Dad to get some Free time. I do this often. Send my kids out with their dad so that I can finish my work peacefully and get some free time. It could be to some park or even for grocery shopping ( for which I give them a long list ) and when they are out, Quickly I finish my chores and take some rest or spend some time on internet or Youtube. My kids always ask me to accompany them when they are going out but few times I refuse, so to get some free time or Me Time and they do understand it and do as I say. So this is a good way to get some Me Time and get some rest. Thankfully my mom’s house is nearby, which is great support for me. My kids enjoy spending time there with my mom and brother, watching TV, talking with them, having their favorite food cooked by their granny. And I also feel relaxed that kids are having a good time there. And I get lots of free time to finish my work and take some rest. So during weekends or holidays, I do send my kids to my mom’s house so that they can enjoy there and I can take rest. So these are my tips and ways to energize myself. Though Parenting is exhaustive, it also gives immense pleasure and happiness to take care of your little ones. Feeding them, Teaching them, Playing with them is all fun But a mom needs to have the energy to do all this. So Moms do take care of yourself properly so that you can take care of your little ones. And at the end of the post, I would like to say HAPPY PARENTING. BE HAPPY WITH YOUR BUNDLE OF JOY AND ENJOY IT. 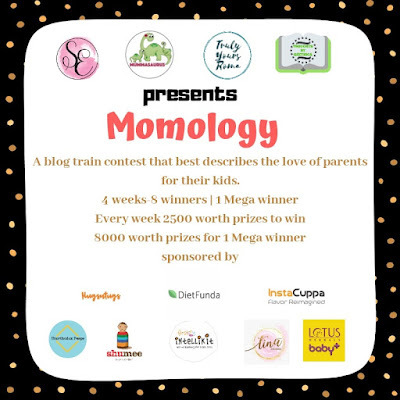 Sponsored by Instacuppa, Diet Funda, Hugs & Tugs, Unorthodoxpeeps, Lotus Herbals Baby, Shumme Toys & Tina Basu. One can check hosts blog to know more about this blog train. I would like to thank Roopali of thehellomomy blog for introducing me to this blog train. Do check her post in this series. Do share your views on this topic. Wow, these are some simple yet effective tips. The ME time is most important for one and all. I simply loved your post. Taking power naps is something I need to learn. Sometimes little bit of changes in our routine can help us in getting the energy back. Sunday mornings are generally for the father to take the kids out to the park. I only go if I feel like it or else take it as an opportunity to find some lone time and just relax. Useful tips ! Taking a nap in the afternoon is so good and makes me happy. Eating well is one thing that we as mothers ignore. But it is time to think of ourselves along with our baby. Thank for participating in momology. Enjoying being a part of this lovely blog train.